Not much baking this week, as I spent a few nights in the beautiful south west of Western Australia for the Margaret River Gourmet Escape. I got to meet some amazing local and international chefs and try some great food. I had a wonderful weekend of food and will definitely be going again next year. Unfortunately it is now back to reality, with lots of unpacking and laundry to do before I head back to work tomorrow. I did, however, cook my Death by Chocolate cupcakes a few weeks ago for a work morning tea, so it is now a perfect time to share the recipe. This is another recipe from Sarah Brigden at babyCakes that works every time and the cupcakes always disappear very quickly whenever I cook them. Like the citrus coconut cupcakes, these don’t contain any butter and are oil based. Again, the mix needs to be made the night before or at least a few hours before cooking to create light cupcakes (it will keep for 2 weeks in the fridge or two months in the freezer before cooking). The recipe does not contain any eggs, so it is good for anyone with an egg allergy/intolerance. As with any recipe using chocolate, use a good chocolate that you like. If you like a dark/bitter chocolate, use that in the ganache and dutch cocoa in the cake mix. I usually use normal cocoa powder (not drinking chocolate) so that the cupcakes aren’t too bitter and a 50% professional baking chocolate (that I get from babyCakes) for the ganache for a rich chocolate taste without the bitterness. 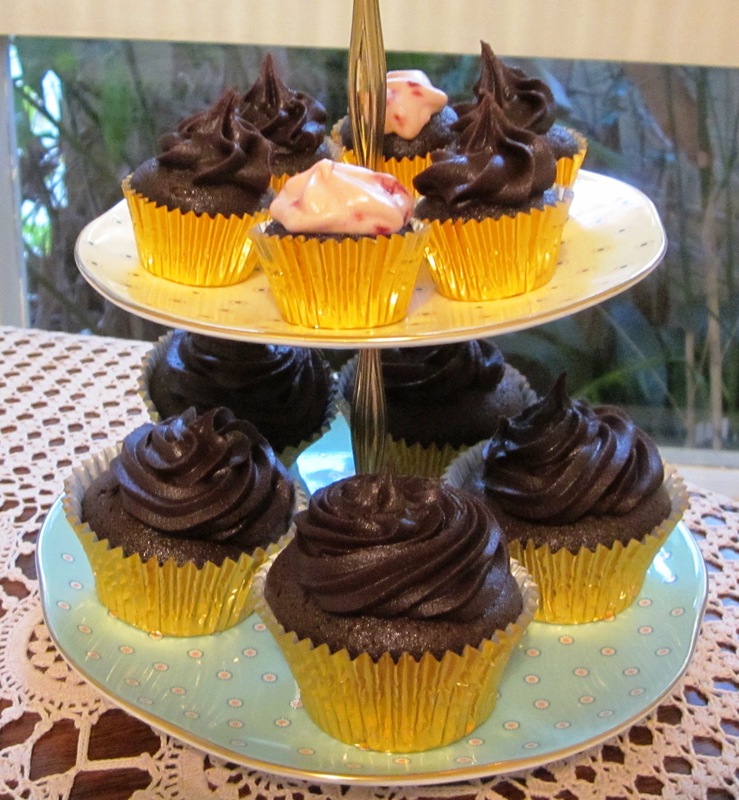 I have also made chocolate orange cupcakes using this recipe by replacing the vinegar and some of the water with orange juice and adding orange zest to the cake mix, as well as orange liquor to the ganache. If I’m making the citrus coconut cupcakes at the same time, I like to use some of the raspberry swirl frosting on some of the chocolate cupcakes as well. If your oven has hot and cold spots like mine, turn the tins around during cooking so that you get an even bake. As long as you don’t open the oven every minute, opening it a few times isn’t a problem. In a large bowl, combine the water, oil, vanilla, vinegar and caster sugar and mix until combined. Sift in the dry ingredients and mix until combined. Cover the bowl or place in a plastic container and place in the fridge overnight or until you are ready to bake. Preheat the oven to 160C (fan forced). Line the cupcake tins and fill about half of the way (no more than two thirds otherwise they will spill over). 1 – 1 ¼ hours for a 20cm cake tin. The cupcakes are cooked if they spring back when you press the top, or a skewer comes out clean. Allow to cool before frosting with ganache (recipe below). You can also make chocolate decorations with melted chocolate or cut up pieces of chocolate bars (it is easier to cut them if you place cool them in the fridge first). Store the cupcakes in the fridge and remove 30 minutes before serving. Place the chocolate in a heat proof bowl and have a whisk or spatula ready. Bring the cream to the boil in a small saucepan until it reaches scalding point (when the bubbles start to rise). Remove from the heat immediately and pour onto the chocolate. Stir until combined. Once combined and shiny, cover and allow to cool before placing in the fridge to cool until the consistency is right for piping. Alternatively, you can make this the day before and store in the fridge overnight. Remove from the fridge two hours before use so it is soft enough to pipe or spread onto the cupcakes. The hot ganache can also be used as a chocolate sauce. You can reheat the ganache in the microwave if you want to use it as a sauce. Adapted from Death by Chocolate Cake & Chocolate Ganache recipes from Sarah Brigden at babyCakes. 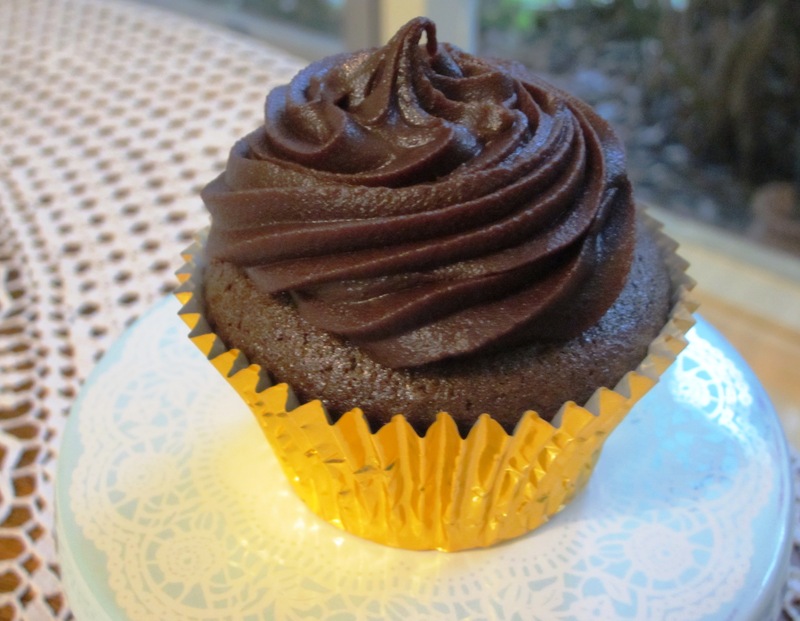 If I was going to be experiencing death by chocolate ….I’d want it to be eating one of these cupcake! I’ve eaten them and they are amazing !